This dessert is everything you want in a dessert – sweet, tart, cold, hot, creamy, crunchy… absolutely perfect. I made it for my friend for her birthday instead of a birthday cake. She couldn’t get enough. Cut banana into rounds and quarter them. Spoon 1/2 tsp. of Nutella & 1/2 tsp. of the chopped banana into the wonton wrapper. Wet the edges of the wonton with water and fold into a triangle, then take the two end of the triangle and bring together to make a pouch. Fry in vegetable oil for 2-3 mins. turning the wontons until they are golden. Remove from oil and put on a paper towel. 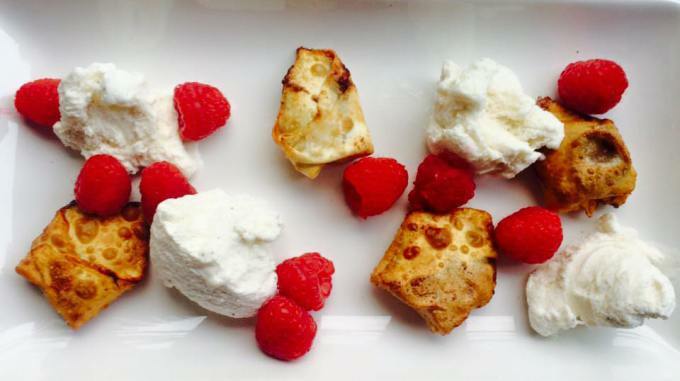 Serve with fresh raspberries and vanilla ice cream.